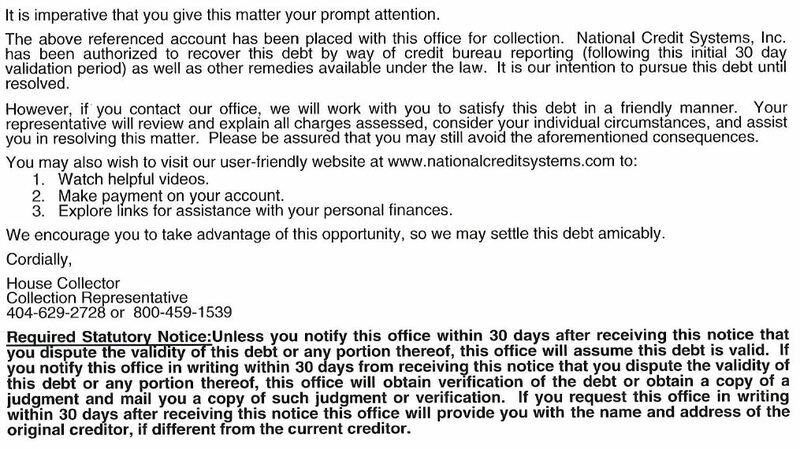 Yesterday I received a letter in the mail from an organization called National Credit Systems. In the letter, they say that I owe them $230 to the apartment manager that I rented from 3 years ago. I have 30 days to contact them. I googled this company and it seems like they are not an official government agency. I don't know if I should ignore them, contact them, or go directly to the apartment manager and ask what's going on. If I did owe the apartment manager money, why did she take three years to contact me? I think that's a bit odd, isn't it? I moved out in 2015 and they are only just contacting me now? Here's a screenshot of the bulk of the letter. In it, they never explain what exactly I owe them for. What do you think I should do? National Credit Systems is a genuine and reputable collections agency. It's a member of American Collectors Association and National Apartment Association. 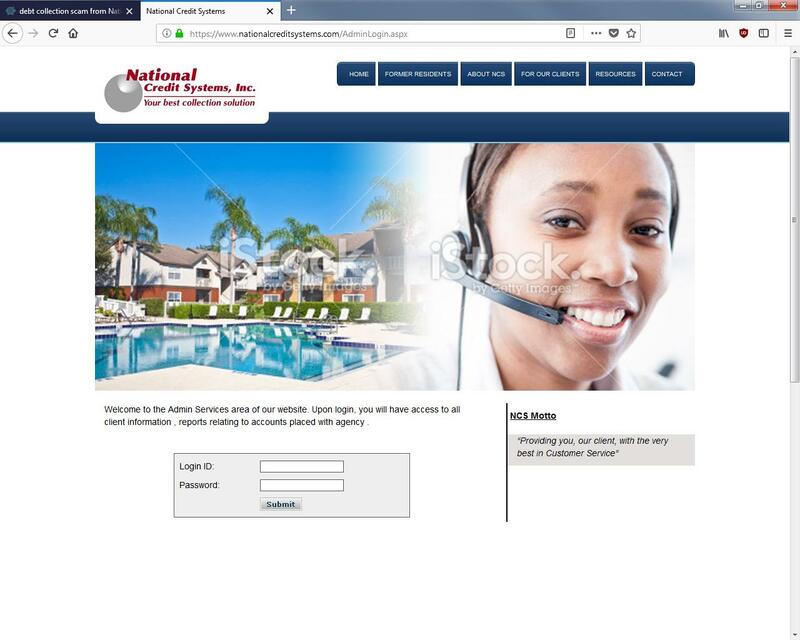 The web site and the phone numbers in the letter belong to National Credit Systems. Of course, even if it's not a scam doesn't mean that you necessarily owe the money. It could be a clerical error or some other misunderstanding. The best way to proceed is to call the numbers in the letter and ask for more details, or just call the apartment manager and ask what the deal is. I had an experience with debt collectors attempting to collect on money that I did not owe. There are some things I learned while resolving this that I think are helpful to anyone in collection especially when the debt is disputed. The reason I was put into collections was because I had failed to file state taxes in a year when I moved to a new state and got married. My bad because I was owed a few hundred bucks by the state. However, when they looked at my federal return numbers, the determined I owed them around $5000 based on the assumption I was a single filer living in the state all year long. Debt collectors often try to panic people. Their goal is to convince you to pay as soon as possible. Don't get angry or threaten them (even if they threaten you.) Be very formal in your conversations. When the legitimate debt collector first found me, she upset my wife and told her that I was some sort of deadbeat. My wife called me at work and gave me the number. I made the mistake of calling from work. I knew it couldn't be real because I've never owed anything like that on state taxes (after withholding.) I contacted the state and tried to get some information. While I was waiting on that, she kept calling me at work daily or more and threatening to garnish my wages or something. It was all nonsense. I explained it was a mistake and she said I should just pay her the $5K and get it back from the state later. I laughed. She wasn't joking. When a debt collector comes after you, they 'own' the debt. Whoever they got it from has already been paid some fraction of the original amount. Any claim that you can get refunded from the original party is highly dubious. The debt collector has no control over that. You might be able to get it if you sue but I wouldn't count on ever seeing the money again. I recently read a really interesting article about a man who was repeatedly harassed over a fabricated debt by multiple collection agencies. His was part of a much larger set of fabrications. Don't pay this debt or even admit to owing it until you have been shown proof of it's veracity. If it's not real get proof in writing in case you are contacted by other collectors later. The first question to ask is "Why wasn't I noticed of this back in the time of relevance? That's a very good question. Now if you just made yourself hard to reach, by moving around all the time and not noticing your landlord of your new address, then meh, maybe. You might even outreach the original landlord and ask him directly. Be very careful dealing with this collection agency. I do not agree with advice to do as the letter instructs. The letter is instructing you to give up all your rights. Demanding they prove the validity of the debt is fine; however the collection agency wants to engage you in conversation, in which they hope to tape-record you saying something stupid or misinterpretable, so they can claim the debt is indeed valid. In spoken conversation it is almost impossible to keep a counterparty from misinterpreting you if they really want to. It's beyond the scope of this answer, but it will hurt your credit badly to acknowledge the debt. Paying on the debt counts as acknowledging it. This restarts the clock on the statute of limitations, reopening the courtroom door and letting them mar your credit report for 7 years from now. It isn't incompetently written nor in broken English. That doesn't make it not a scam. "Scams have obvious errors" has become such a trope, that successful scammers are getting a lot of mileage out of making theirs picture perfect. And this one is picture-perfect with all the correct language to push the limits of the consumer protection laws in the normal ways collectors do. For instance, someone may have hacked the landlord computer, or an ex-employee absconded with a list of past tenants, and decided to "trump up" some fake multi-hundred dollar charges. The size of the debt is very correct for this scam: at $300, a large number of people pay it to make it go away and virtually no one will aggressively challenge such a debt. The collection agency may be legit; the scammer may have sold him bogus debt. As the attached letter references, you are being advised to contact the company in writing within 30 days of receiving the letter. It's clearly written that to neglect to do so validates the debt and the following collection actions. It's wise to do exactly as directed, write a letter, send it return receipt requested and await the clarification of the alleged debt. Phone calls and emails are fine, but do not qualify for the conditions noted in the letter. Insist on getting a copy of the receipt for your debt. Ask them to provide you with the documentation for the debt: why do they claim you owe the debt, and what proof do they have. You should look into the statute of limitations and see whether it has lapsed. They likely bought the debt at a high discount and would be willing to take a fraction of what they're claiming, but you need to make sure that if they accept a partial payment that they are accepting it as fully discharging the debt, and won't report it to credit agencies as a default. Be careful not to say anything that can be construed as acknowledging the debt during the negotiations. Not the answer you're looking for? Browse other questions tagged debt scams rent debt-collection or ask your own question. How badly does a collection account sent to the credit bureau hurt my credit score? How can I inform the collector that I have paid the landlord in full, to update my credit report? Will it help my credit score? Should I communicate with a collections agency to dispute a claim after it's been deleted from my credit report? Student debt in arrears from living overseas- what to do?